WASHINGTON–The number of foreign-born people in the United States grew last year to its highest share in over a century, according to Census Bureau data published on Sept. 13. But so far, said Randy Capps, a demographer at the Migration Policy Institute, the government hasn’t restricted legal immigration much and America’s strong job market likely fueled part of last year’s increase in the foreign-born population. “The economy’s definitely a factor in this, not just in more people coming but in more people staying,” Capps said. 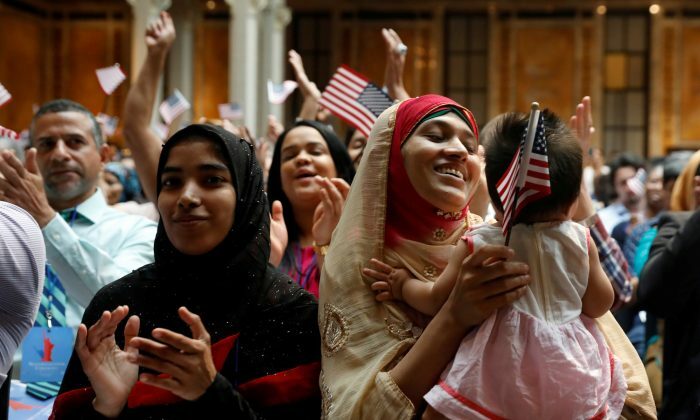 Foreign-born residents made up 13.7 percent of the U.S. population in 2017, up from 13.5 percent in 2016, according to the Census Bureau’s estimates. That put the proportion of immigrants in the United States last year at the highest since 1910, when they made up 14.7 percent of the population. The data comes from the government’s annual American Community Survey, which demographers consider the most comprehensive source for estimating the immigrant population. Demographers say the survey likely undercounts those in the country illegally. Illegal aliens can be more difficult for surveyors to locate due to informal living arrangements, and some may avoid being included in surveys for fear of being reported to the government, researchers say.